As a nation built on immigration, humanitarian migrants (refugees and others in refugee-like situations) make up only a small proportion of the entrants who settle in Australia. Over time, however, these refugees have made an enormous contribution to the nation. Ensuring their successful integration has been vital to building a prosperous, welcoming and proudly multicultural Australia. The bipartisan commitment supporting refugee resettlement is the strongest affirmation of Australia’s global citizenship. The Australian Government is determined to ensure that people settling in Australia have the help they need to rebuild their lives and become fully functioning members of the community. There is overwhelming evidence that employment provides the bedrock for successful settlement. The best way to help humanitarian migrants to build flourishing lives is to help them find work. But how effective are Australia’s settlement services with respect to employment? Are we drawing on our full potential to ensure the best economic, social and civic contributions of refugees to our society with the employment and settlement services currently in place? 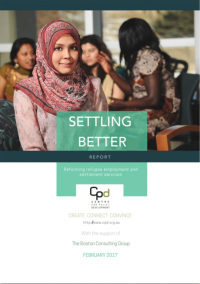 CPD latest report, Settling Better: Reforming refugee employment and settlement services, takes a look at these questions. 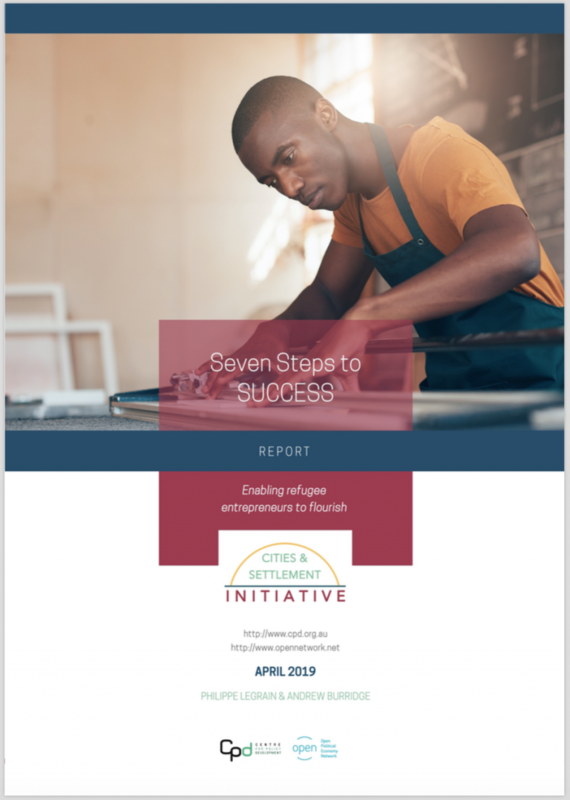 Written by CPD Research Associate Henry Sherrell and prepared with the support of the Boston Consulting Group, Settling Better calls for a new approach to refugee employment and settlement services. This is the first time the Building a New Life in Australia longitudinal research survey data has been analysed publicly. The genesis of this report was an August 2016 roundtable co-hosted by the Centre for Policy Development and the Centre for Public Impact, a BCG Foundation. The roundtable featured insights from experts and policy makers from Australia, Canada, the United States and Germany on settlement services and labour market integration for refugees. 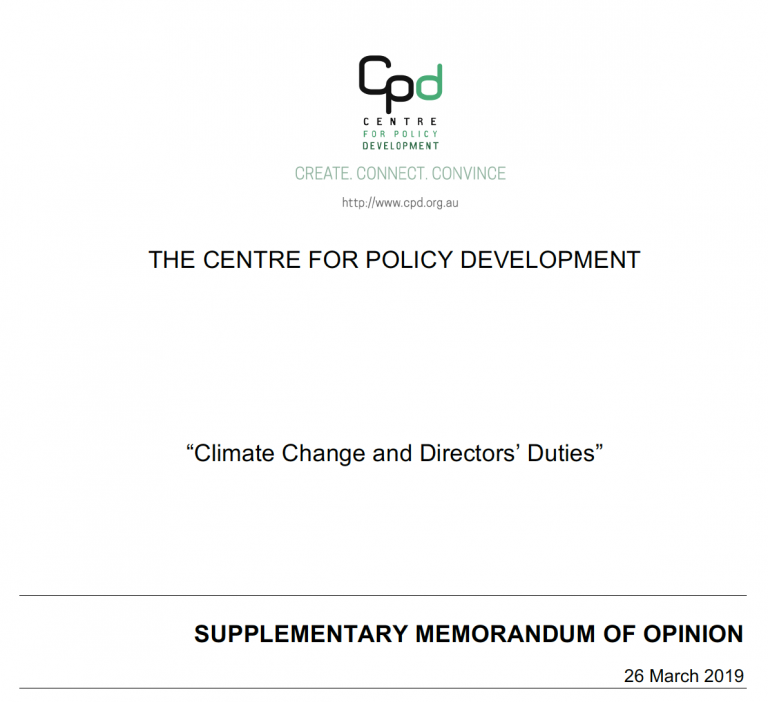 We are grateful to all those who participated, many of whom have since provided feedback on this report. The weak link in Australia’s settlement record is getting refugees into jobs soon after they arrive. Getting more refugees into jobs faster would be a triple-win for Australia: it would benefit vulnerable people, boost the budget and improve social cohesion. Analysis of the latest data reveals five primary barriers to newly arrived refugees finding jobs: limited English, a lack of work experience, poor health, a lack of opportunities for women and having only been in Australia for a short amount time. Even a modest improvement in employment outcomes would generate major fiscal benefit for government – reinforced, of course, by the broader benefits to social capital and cohesion and to migrants themselves. Reducing the participation, income and unemployment gap by 25 per cent between just one annual quota of refugees and the average person in the labour market will create $465 million worth of income for refugees and their families and is worth $175 million to the Australian Government’s budget bottom line over the next decade. We must act now as the economy changes and demand for low skill labour drops. There is much we can learn from promising practices overseas, including in skills recognition, private and community sponsorship and microfinance. Renewed investment in existing programs built on a more accurate evidence base. Developing microfinance options that could be of particular benefit to women and their families. 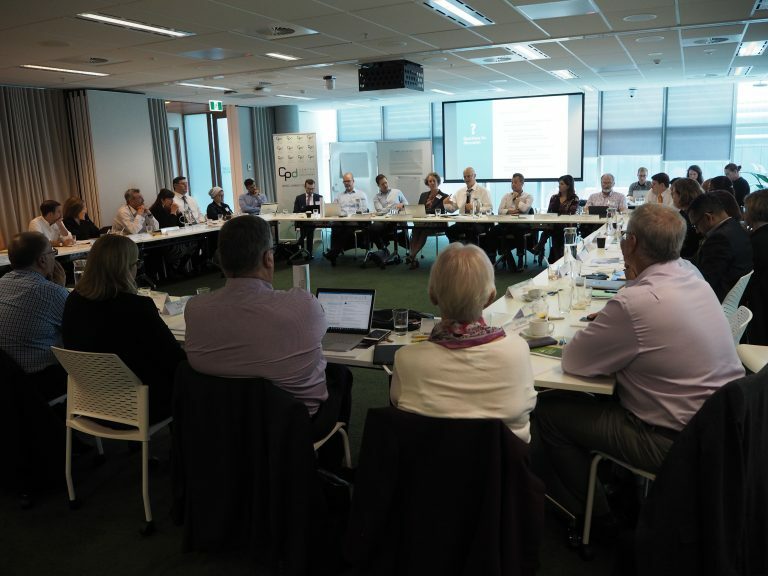 Formalising government priorities in an updated National Settlement Framework. Since the end of World War II, successive governments have helped more than 800,000 refugees and displaced people of different nationalities and faiths to build new lives in Australia. Our humanitarian migration program –one of the world’s largest – enjoys the backing of all major political parties and broad community support. As Prime Minister Malcolm Turnbull confidently told the UN General Assembly in September 2016, ‘Australia is one of the most successful multicultural societies in the world’. Australia’s achievement rests in large part on the effectiveness of its post-arrival settlement program. ‘No country has integrated newcomers as well as we have,’ says former immigration department head John Menadue AO. Australia provides refugees with services to help them overcome past trauma and integrate into the community. It offers hundreds of hours of free English classes and provides immediate access to government benefits and public healthcare. The active engagement of a myriad of community organisations helps refugees to build social connections and find their way in a new society. Over time, these resettled refugees and their children make an enormous contribution to the community and the economy. If there is a weak link in Australia’s settlement record, it is getting refugees into jobs soon after they arrive. There is overwhelming evidence that employment provides the bedrock for successful settlement. The best way to help humanitarian migrants to build flourishing lives is to help them find work. Yet the current expansion of Australia’s humanitarian program comes at a time of profound changes in the economy that mean many of the jobs taken up by refugees in the past are becoming scarcer. 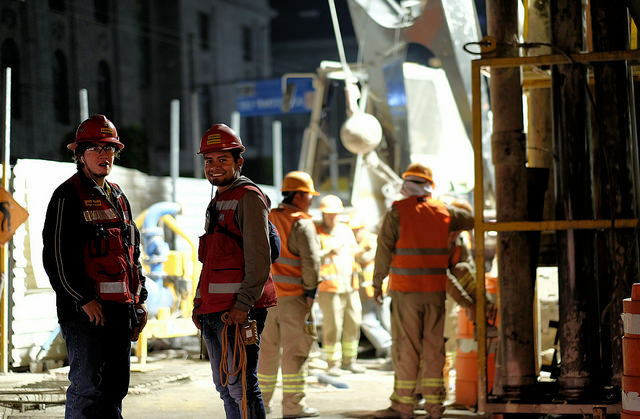 Two out of five recently arrived humanitarian migrants work as labourers, but the need for labourers in the economy is falling. Refugees may also find jobs as machinery operators or drivers, but demand for workers in these roles is stagnant. On the best available evidence, 17 per cent of humanitarian migrants are in paid work after being in Australia for 18 months. While employment rates improve with time, to get more refugees into jobs more quickly would be a triple-win: it would benefit vulnerable people, boost the budget and improve social cohesion. This report identifies five principal barriers to newly arrived refugees finding jobs: limited English, a lack of work experience, poor health, a lack of opportunities for women and having only been in Australia for a short amount time. If we want better employment outcomes then it makes sense to focus on removing these barriers or reducing their impact. There is much that we can learn in this regard from best practice from overseas. There is plenty of evidence that settling humanitarian migrants better will have substantial payoffs. Statistics show that refugees are more entrepreneurial than other migrants and that over time they can catch up with others in the job market. But there is potential to accelerate their entry into work to the benefit of all. If the labour market outcomes for just one year’s intake of humanitarian migrants improved by 25 per cent, then over the subsequent decade those new arrivals would be $466 million better off and the Australian government would bank $176 million in budget savings. To achieve this outcome year on year would compound the benefits, producing additional income for humanitarian migrants of close to $2.5 billion and a gain of almost $1 billion for government revenue over the subsequent decade. The rewards from this growing dividend are far more than financial. Expanding employment opportunities for refugees is central to successful integration. Better job outcomes will strengthen social cohesion and help reduce alienation and extremism – not just amongst refugees, but also amongst those established members of the Australian community who might fear or resent the presence of newcomers. If Australia is to remain a leader in refugee resettlement then we must adapt in the face of change. Political leadership and investment must nurture the public legitimacy that forms the bedrock of the humanitarian program. This report charts the path forward. It explains how our proposed three-pronged approach can improve settlement services, build social cohesion and prosperity, and sustain confidence in Australia’s humanitarian program as one of the world’s best. Boosting Refugee Jobs Would Be A Win-Win For Australia, The Huffington Post, Henry Sherrell and Travers McLeod. Finding jobs faster for new refugees a ‘triple win’ for Australia, report finds, The Guardian, Ben Doherty. We’ve lost the knack of finding jobs for refugees, The Australian, Terry Moran and Larry Kamener. AMP, Harvey Norman, Woolworths and Telstra back refugee jobs plan, Australian Financial Review, Laura Tingle. A Significant Contribution: The Economic, Social and Civic Contributions of First and Second Generation Humanitarian Entrants, Department of Immigration and Citizenship, 2011. 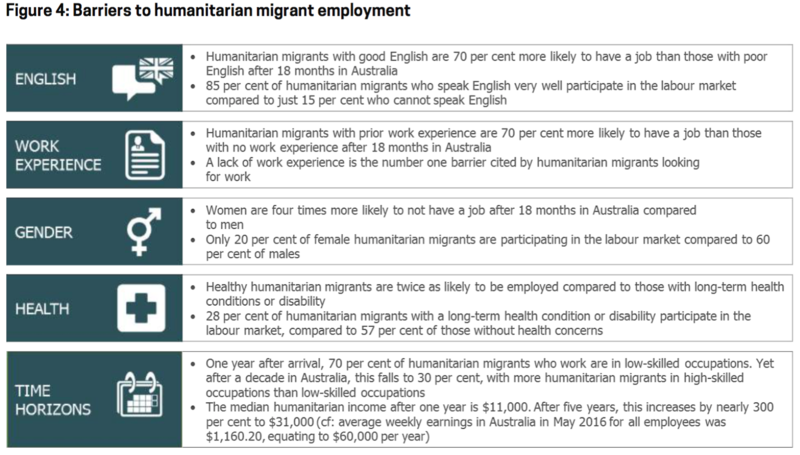 Building a New Life in Australia: The Longitudinal Study of Humanitarian Migrants, Department of Social Services, 2015. The most comprehensive study of refugee settlement in Australia, by Graeme Hugo and others, concluded that “the overwhelming picture when one takes the longer term perspective of changes over the working lifetime of (humanitarian) settlers and their children is one of considerable achievement and contribution.” That is certainly the view of Foundation House, which has assisted thousands of refugee settlers, from many countries, over several decades. But we can and must do better, in particular to help refugees find employment more speedily than is currently the situation. Achieving this demands a robust analysis of the barriers facing those able and keen to work and new ideas to overcome them, to be examined closely and trialled. Settling Better provides both and will provide a welcome focus for informed discussion among policy-makers and settlement agencies. I look forward to participating in that process. 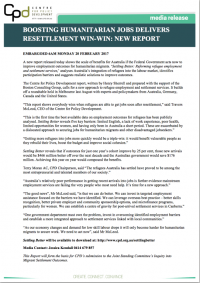 The Refugee Council of Australia welcomes the report ‘Settling Better’. Secure, meaningful employment is vital for successful settlement. While new refugee communities are eager to find work, there are many systemic barriers that create difficulties for this group. This report puts forward clear, sound and evidence based solutions to support more people enter the workforce. Developing a specific employment service for new arrivals, expanding private sponsorship and re-centering refugee policy within one key department are recommendations that RCOA has also been advocating for. This report shows that supporting newly arrived refugee communities to gain employment faster not only benefits new Australians, but also has economic and social benefits for the wider Australian community. I worked in the Dept of Immigration and Multicultural Affairs/Citizenship etc for many years across many programs including refugee settlement. I know work as a volunteer for a small NGO, previously BSL, helping refugees and some asylum seekers with resumes and job search. Jobactive networks don’t do resumes from my experience. They send refugees to people like me. I think it would be preferable to reunite the Departments of Immigration and Settlement as they were before (and there was AMEP supervision there as well) rather than keeping them separate. Immigration and settlement are very closely linked and keeping them together increases all staff members understandings of the whole journey. You might also get a minister who had some understanding of the whole process but could be wishful thinking. Putting Settlement in Social Services has some merits but there is a danger of it being swamped and losing funding to other ‘mainstream’ services.